The activity of the large dogs, along with their large body mass, can lead to stress on your joints. With the time the joints can become sensitive, which can lead to problems of mobility. The formula of MAXI JOINT CARE with their cocktail exclusive, and EPA-DHA helps to facilitate the movement and keep the joints healthy. 97* of dog owners are satisfied after 1 month of use. 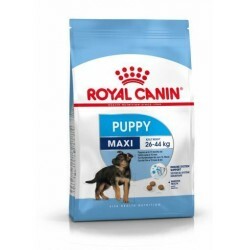 *Internal analysis of Royal Canin conducted with 60 dogs of large size. The formula of MAXI JOINT CARE contains unÂ signature cocktail with hydrolysed collagen to help the cartilage during aging, and a joint function healthy. I think for large dogs from 15 months with tenderness in the joints. Made with few calories to keep you at an ideal body weight. The EPA-DHA and hydrolyzed collagen help to improve the cartilage and the joints. Enriched with glucosamine and chondroitin to promote joint health. Complete food with quality ingredients that meets the nutritional needs. I think dry complete for adult dogs, and older (over 15 months) and large size (from 26 to 44 kg) with joint problems. Ingredients: corn, dehydrated poultry proteins, wheat, animal fats, vegetable fibres, isolated from vegetable protein*, maize flour, rice, hydrolysed animal proteins, maize gluten, beet pulp, fish oil, yeasts, minerals, soya oil, hydrolysed collagen (0,84%), extract of Rosa India (source of lutein), hydrolysed cartilage (source of chondroitin). *L. I. P.: protein selected by its high assimilation. Constituents analytical: crude protein (26%), fats (15%), crude ash (6,2%), crude fiber (6,3%), moisture (9.5 per cent), starch (30,3%), calcium (1%), phosphorus (0,6%), omega-3 fatty acid (0,82%), omega 6 fatty acids (to 2.69%), EPA/DHA (0,4%), biotin (1,11 mg/kg), DL-methionine (0,44%), arachidonic acid (0,07%), linoleic acid (2,49%), taurine (1800 mg/kg), L-lysine (0,99%), arginine (1,34%), L-carnitine (200 mg), dietary fibre (13%), vitamin A (18000 IU), vitamin C (280 mg),vitamin E (470 mg), methionine cystine (0,87%), extract-free nitrogen (ELN) (37%). Minerals: potassium (0,6%), magnesium (about 0.07%), mn (67 mg/kg), zinc (196 mg/kg), selenium (0.22 mg/kg), sodium (0.4 per cent), chlorine (0,87%), iodine (4,6 mg/kg), iron (189 mg/kg), copper (15 mg/kg). Vitamins: vitamin B5 (pantothenic acid) (26 mg/kg), folic acid (0.9 mg/kg), vitamin B6 (pyridoxine) (8,4 mg/kg), vitamin B1 (thiamine) (4.3 mg/kg), vitamin B12 (cyanocobalamin) (0.07 mg/kg), vitamin B2 (riboflavin) (3.9 mg/kg), vitamin D3 (1000 IU/kg), choline (2200 mg/kg), vitamin B3 (niacin) (15,4 mg/kg). Nutritional additives (per kg): vitamin A (16000 IU), vitamin D3 (1000 IU), E1 (iron) (42 mg, E2 (iodine) (4.2 mg), E4 (copper) (13 mg), E5 (manganese) (55 mg), E6 (zinc) (164 mg, E8 (selenium) (0.08 mg). Additive technology: clinoptilolite of sedimentary origin (10 g). Additives organoleptic: green tea extract (source of polyphenols) (2.5 g). Preservatives and antioxidants authorized EC. The table shows the daily amounts to give to an adult dog. Are recommended amounts so you should adapt them to the level of activity and specific characteristics of your pet. Your dog should always have fresh and clean water. Save this container in a cool and dry place. 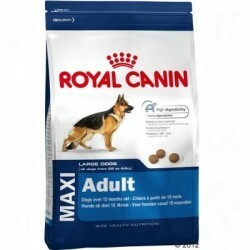 Description: The feed Royal Canin Maxi Joint Care is indicated for adult dogs and older large size (from 26 kg to 44 kg of weight) and from 15 months of age, who have tenderness in the joints .